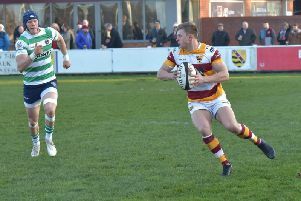 Six tries gave Fylde RFC a 42-20 win against South Leicester at the Woodlands. 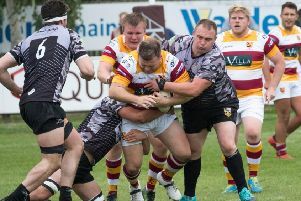 It wasn’t a perfect Fylde performance by any means – their opponents dominated too much possession and territory in the second half – but when Fylde’s expansive play works it is excellent to watch and sees them as the third highest scorers in National Two North. Fylde started the game very much on the front foot. In the second minute, South Leicester’s fly-half Ben Palmer spilled a low pass and a rampaging Sam Dugdale was on the loose ball in seconds. The bounce was kind and he gathered and scored easily near the posts with Greg Smith adding the conversion. South warmed to their task as they established continuity in working their way upfield and retaining possession well through several phases. They got on the board in the 12th minute when they attacked right before moving the ball quickly through their backs for Michael Ogunwole to race over in the left corner. Leading 7-5, Fylde were soon back on the attack and spreading the ball wide at every opportunity. On 16 minutes, their backs went left and they had spare men on the outside before Palmer was adjudged to have deliberately knocked the ball on, denying the home side a possible try and being sent to the sinbin. From the subsequent penalty Fylde launched a backs move and Tom Carleton neatly set up Henry Hadfield to score, Smith adding the extras. From South’s restart kick, Fylde lock Nick Ashcroft was accidentally taken out in the air by Ogunwole, who joined Palmer in the sinbin. However, Fylde could not exploit their two-man advantage and add to their lead as South Leicester’s forwards dug in, retained possession and pressed Fylde back into their own half. Stand-in kicker Isaac McNulty reduced their deficit to six points with a penalty making it 14-8 after Dave Fairbrother was deemed to have held onto to ball at a contested ruck. With South restored to 15 players, Fylde launched an attack deep within their own half. Connor Wilkinson found Hadfield, who battered his way past a couple of tacklers and broke downfield, shrugging off a couple of others before neatly offloading to Carleton, who raced under the posts with Smith converting. A few minutes later, the Fylde backs moved right with Wilkinson tackled short of the line but Cameron Crampton quickly fed Tom Grimes to score in the corner. Smith’s conversion from the touchline was perfect and Fylde took a 28-8 lead into the interval. Head coach Warren Spragg introduced three replacements for the second half, with Gus Warr, Bevan Rodd and Alex Loney coming on. The second half began in a similar fashion as Fylde were soon on the attack, though South were not helped with injury forcing off Martin Wolfenden. Three minutes into the half and Warr plunged over for his maiden Fylde try after Dugdale forced his way to the line before offloading. Smith’s conversion extended the lead to 27 points at 35-8 but it was South who dominated the next 30 minutes. With Will Ward leading the forwards’ charge, they kept the play tight, retained possession well and went through many phases. If the first-half penalty count was in Fylde’s favour, then it was very different in the second period as they were penalised time and again in trying to wrestle away possession. Ward forced his way over for South’s second try on 50 minutes, only for Palmer’s kick to hit the post. Play continued in the same vein as South dominated possession with Fylde making errors as they tried to re-establish control. In the 59th minute, more South pressure ended with skipper Javiah Pohe powering over from close range with Palmer converting to make the score 35-20. The spectre of a dramatic turnaround raised its head as South retained the upper hand and the Fylde defence was sorely tested. A crucial turnover came with 10 minutes left when Fylde were near to their own line, allowing them to clear the ball downfield in the process. They celebrated with the best try of the afternoon on 79 minutes. Fairbrother secured possession on his own 22 and the ball was worked left to Ben Gregory, who raced down the touchline before linking up with Carleton and Matt Garrod who played Chris Briers in for Fylde’s sixth try; a fine way to end the game. Fylde: Carleton; Hadfield, Briers, Wilkinson, Grimes; Smith, Crampton (Warr 40); Horner (Rodd 40), Gregory (Loney 40), Lewis (Joyner 60), Ashcroft (Garrod 57), Parkinson, O’Ryan (Gregory 69), Dugdale, Fairbrother.